Last year I made a Chicken Stock and a Vegetable Stock and I loved how easy it was - not to mention how they naturally seasoned my recipes. I really want to try to make a Fish Stock, a Duck Stock, a Pork Stock, a BBQ Beef Stock, and a Roasted Vegetable Stock (among many others). Another stock I wanted to test out was a Homemade Meat Stock. Before I actually made the stock, I researched several recipes such as Cantaloupe Alone's Baked Bone Stock, a stock recipe from Straight Into Bed Cakefree and Dried, and a meat broth recipe from the book The Classic Italian Cookbook . All very different, Cantaloupe Alone's and Straight Into Bed's focuses on oven baking the meat bones to extract the flavors while the recipe from The Classic Cookbook involves a boiling method. Having a basic idea of what ingredients I wanted to use, I decided to boil my stock (mainly because my oven is not reliable and is also very old). For my stock, I used fresh beef parts, along with some fresh parsley, thyme, leeks, bay leaves, celery, carrots, onions and a potato. The whole process took about three hours to cook and some salt was added during the end to taste the stock. A simple recipe, I loved how flavorful this homemade stock was and how many new soups are going to come out of this easy and rich stock. Add water to a large soup pot and let boil. Cut up the onion, carrot, potato, leek, parsnip, and celery and add them to the pot, along with the bay leaves, thyme, and parsley. Wash the meat and add them to the pot. Lower flame, cover, and let cook for approximately 3 hours - checking on it periodically. During the last hour, add some salt and taste. Turn off the flame and strain the meat and vegetables. Let cool and freeze or use your stock and meat for another soup! Enjoy. Tip: When freezing, keep the fat in the stock in order to seal the flavors. This layer will be easy to remove when you defrost your stock. How do you make your meat stock? Although I love creating homemade meals and soups at home, there are some days when that seems downright exhausting. Ordering in offers the best of both worlds - the chance to be home but you don't have to cook! AllMenus.com, an online food ordering company, wants to encourage more people to eat out but for less with "National Order-In Day" on March 31st. Customers will get 50% off their take-out bill of $40 or more that is designed to offer consumers a hassle-free way to enjoy over 250,000 restaurants nationwide on Allmenus.com and through its sister site Campusfood.com. "We honor the busy, the lazy, and the hungry. Our web and mobile sites and services let people enjoy great food in a convenient way, a process which will now be celebrated with its own day," Sloan Gaon, CEO, Dotmenu stated. Through this campaign, people all over the country can “check-in” to the national holiday on Foursquare as well! Lentil soup is one of my all-time favorite soup recipes. Despite the thousands of soups I want to create (and hopefully will) sometimes only this classic and comforting bowl of soup will do. After a frigid day at the zoo with my family, I decided to make lentil soup but wanted to vary the recipe a bit. I decided to add coconut milk and some curry for a slight nutty taste. I also added some mint, lime, and ginger to balance out the flavors. Since Mr. Soupy aka My Income Lab is my official taste-tester, he gave me some critic to the recipe. He didn't think the mint was needed since it overpowered the other flavors - so keep that in mind if you choose to use that herb. Overall, this is a very easy soup recipe (for a bean-based soup can) that can be whipped up in less than two hours. Enjoy! Add water to a pot and let boil on a medium heat. As the water starts to boil, cut up the ginger, onions, and garlic and place them into the pot, along with the bay leaves. mint and rosemary. Cover and lower flame. Let cook for 10 minutes. 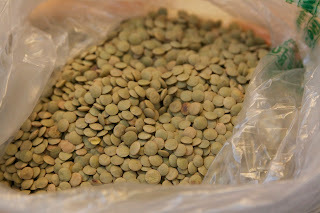 Add the lentils and let cook for about an hour. Cut up the celery, carrots, zucchini, and add them to the pot, along with the curry powder, salt, pepper, lime and coconut milk. Cover and let cook for another 10-15 minutes. Taste and drizzle with some lime - you may need to add more salt and pepper. 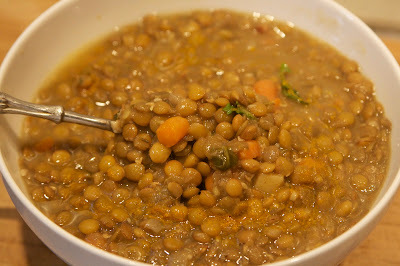 What is your favorite recipe for lentil soup? 1. 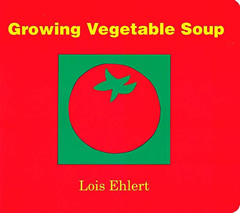 Growing Vegetable Soup - A recent find from the library, Lois Ehlert's story cleverly shows how soup starts as a seed. Beginning as an idea between a Dad and his child, Growing Vegetable Soup explains how seeds are planted, watered, and taken care of until they grow into vegetables. Finally, they pick and dig the vegetables and make a soup together. 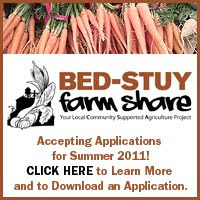 I love the concept of growing food and how that experience is shared among a parent and his child. The story also ends with a vegetable soup recipe by Peggy Daum. 2. Stone Soup - The classic folktale about how a kid tricks an older woman into making him a bowl of soup with a stone. 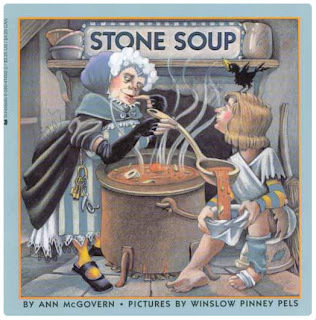 Starting by asking for water and then meat, vegetables and butter, the stone soup grows into a hearty bowl of soup. This version by Ann Mcgovern is considerably shorter and is designed for children 4 through 8 years old. 3. Little Critter: Snowball Soup - As a part of the Little Critter series, this book follows how Little Critter, Little Sister, and their Dog make soup for their snowman. 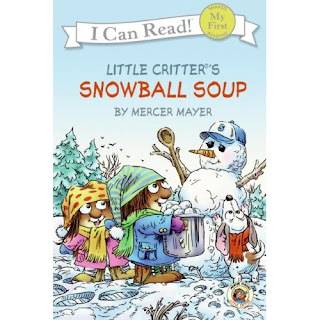 Written by Mercer Mayer, Little Critter: Snowball Soup is designed for kids 3 to 6 years old. 4. 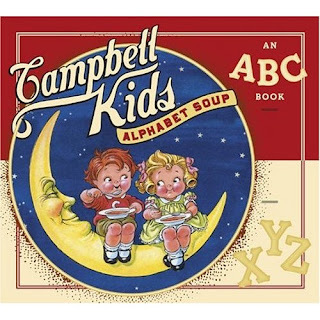 Campbell Kids Alphabet Soup - Featuring advertising art from the Campbell's soup company, the book is not just about soups but a fun ABC book featuring art from over 100 years ago. The colorful illustrations are also fun for older readers to share with their grandchildren aged 4 to 8. 5. 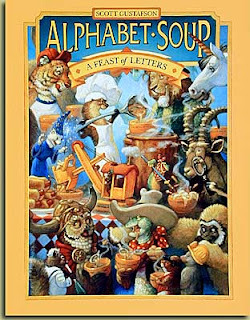 Alphabet Soup - A book designed for children in the second grade, Alphabet Soup follows otter (the new kid) who invites his friends to his house for a soup party. They all bring ingredients from A to Z that are added to a communal pot as they create a massive bowl of soup. What children's books featuring soups have you read? It is still pretty nippy out there and I even saw some snow this morning - despite the fact that it is technically spring. To take refuge, I am still enjoying hearty soups like this chunky tomato vegetable recipe. Originally featured as a guest post on Mom in the City, I recently made this soup using beans, tomatoes, onions, kale, carrots, broccoli, dried basil and rosemary. This recipe is also very flexible and you can use any variation of vegetables that you have or add some pasta or rice for a quick and hearty post-winter waiting for warmer days soup. Drizzle some olive oil on the bottom of medium-sized pot. Cut up the tomatoes (or open the can) and add them to a pot. Let cook for 5 minutes and add one cup of water. Remove from flame and blend together using a hand mixer – should be slightly chunky. Return to a low flame and add the rest of the water and cover. Cut up the onions and garlic and add them, along with the basil, rosemary and bay leaves to the pot and bring to a slight boil. Prepare and cut up the carrots, potatoes, kale and broccoli and add them to the pot along with the beans and some salt and pepper. Stir and bring to a medium-heat. Cover and let cook for 30 minutes, checking on the soup periodically. Taste and add more salt or pepper, if necessary. Enjoy! Top with Parmesan cheese or croutons. 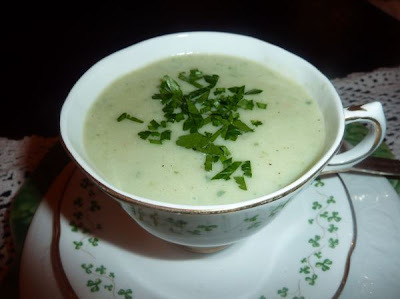 We have a tendency to think of fresh herbs and something to add to a soup, but surprise yourself when you make this soup (especially in the spring and summer) with fresh herbs from your own garden. Here in Florida we have these herbs in our backyards year round but spring seems the appropriate time to really celebrate them wherever you may live. If there is something I love more than soup it is peanuts and peanut butter. A creamy and high-protein food packed with vitamin E and vitamin B, peanut butter is the perfect healthy snack that I love to eat with carrots and apples or as a simple sandwich with jelly. I also recently learned from The National Peanut Board that peanuts are a great ingredient to add to salads, stews and soups and being that it is National Peanut Month this is a perfect time to share some of their delicious and healthy soup recipes. I included three recipes that peanut and soup lovers will enjoy - including a Spicy Peanut Soup with Avocado Salsa, Hearty Quinoa and Peanut Soup, and a Two Continent Peanut Vegetable Soup. 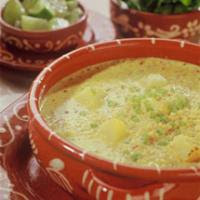 The National Peanut Board's website also includes delicious recipes for a Cauliflower Soup with Peanut Arugula Pesto, Posole Green Chile Peanut Stew, a Spicy Senegalese Sweet Potato & Peanut Soup and a Creamy Ginger Carrot Soup. 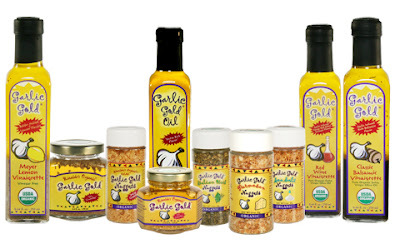 With all of these options, you'll never look at that jar of PB the same again. In a large soup pot, melt butter over medium-high heat. When butter foams, add red onion, leek and celery. Sweat down for five minutes, stirring occasionally. Add sweet potato, tomato, curry and chipotle. Cook for five minutes. Stir peanut butter into the pot. Add chicken stock and bouquet garni and bring to a boil. Simmer and cook for twenty minutes, or until sweet potatoes are soft. Add cream. Remove from heat and let cool slightly. Puree soup while still warm in batches in a blender, taking extreme care not to overfill the blender. Once pureed, pass the soup through a fine mesh strainer and season. Heat it up when you are ready to serve and garnish each bowl with a tablespoon of avocado salsa and some roasted peanuts. Mix all ingredients and season the mixture. Snugly cover with plastic wrap for later use. Place quinoa in a medium-sized saucepan and cook dry, while stirring, over medium heat until the quinoa has a nutty aroma and begins to pop slightly. When the quinoa has toasted, add 6 cups of water; bring to a boil over high heat. Lower heat to medium and simmer for 20 minutes. Drain in a colander and reserve. Heat the oil in a saucepan over medium heat. Add the onion and sauté until soft, about 4 minutes. Stir in the cumin and sauté briefly. Add half of the crumbled cheese and cook, stirring, for 30 seconds. Add the salt, potatoes, 1 ¼ cups water and 3 cups milk; simmer until the potatoes are soft, about 20 minutes. Stir in the quinoa and the ground peanuts. Add remaining cheese and stir to mix for 2 to 5 minutes. Thin with more milk if the soup is too thick. Adjust seasoning with lime juice to taste and garnish with Serrano pepper and cilantro. In large stockpot, with cover, heat oil. Cook onion, celery and garlic, over medium-low heat, for 10-15 minutes, or until soft. Stir in peanut butter until thoroughly combined with vegetables. Add broth and bring to boil. Add kale, bring to boil again, reduce heat, cover and cook 10-15 minutes. Add potatoes, salt and pepper; cover and cook additional 10 minutes or until potatoes are fork tender. Add corn; turn off heat. Add hot sauce to taste. Let sit 5 minutes. To serve, ladle soup into bowls, adding 1 Tbsp peanut to each serving. Have you ever made soups with peanuts? Add water to a medium-sized pot and let boil on a low heat. Cut up the onions and potatoes and add them to the pot, along with the garlic, rosemary and thyme when the water boils. Cover and let cook for 10-15 minutes. Add in the green vegetables, salt and pepper and cover for another 15 minutes. Blend the mixture and top with yogurt. Enjoy! For St. Patrick's Day this year I wanted to make a traditional Irish Beef Stew. Although this is a slight deviation from soup making, I thought it would be an interesting recipe to try out - using similar cooking techniques that I have been using on the site. For the stew, I used a flavorful base of onions, rosemary, garlic, parsley, tomato paste, thyme and bay leaves that was slowly cooked with beef tips and dark beer. The result was a distinctive and hearty stew that can be also made with mutton or lamb. Enjoy and Happy St. Patrick's Day! Drizzle olive oil in a pot and chop up the onions and garlic and add them to a pot. Cook on medium heat and add in the thyme, bay leaves, rosemary, parsley, tomato paste and some water and let cook for 10-15 minutes. Cut up the carrots and potatoes. Stir the mixture and add them into the pan. Reduce flame and add in the beef and beer. Let cook for an hour, checking on it periodically and tasting as you go. Enjoy! Serve with Irish Soda Bread by Simple Bites. For the soup tour, I originally planned to take the group to Marco Polo, a restaurant that specializes in wonton and dumpling-based soups. Unfortunately, I later learned that Marco Polo closed down so we decided to check out Tasty Hand-Pulled Noodles for some hearty (and cheap) bowls of vegetable and meat noodle-based soups. Since I learned a lot about wontons and wasn't able to talk about it on the tour I thought it would be a great Soup 101 piece for the site. After you learn more about some wonton basics, you can also find some wonton-related links on how to make your own as well as how to wrap wontons and three wonton soup recipe to try out at home. Enjoy! Wontons originated in North China. 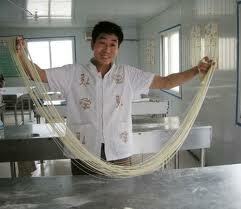 Viewed in ancient China as a sealed stuffed bun without holes and was named "Huidun" (meaning chaos). It was later changed to wonton. 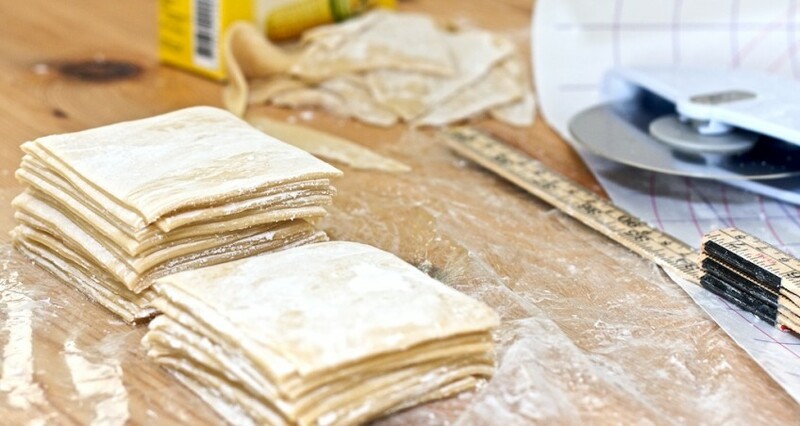 Wonton wrappers are generally made with flour, water, salt, (and sometimes eggs). They are then stuffed, wrapped, steamed, boiled or fried. 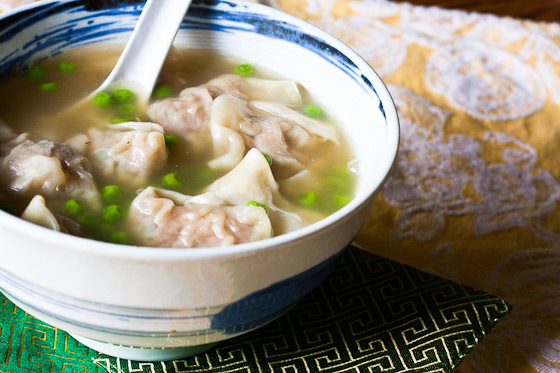 Wontons are generally thinner than dumplings, which become transparent after they are cooked. The filling is typically made of: Minced pork, Coarsely diced or whole shrimp or oysters, Finely minced ginger and onion or carrots and Sesame oil and soy sauce. A triangle is the most common shape of a wonton. This is made by folding the wrapper in half by pulling together two opposite corners. Homemade Wonton Wrappers - An easy homemade wonton recipe by Kitchen Simplicity that includes a simple mixture of flour, eggs, salt and water. The recipe also includes helpful tips about freezing wontons, preserving them in cornstarch and how they can made super thin in a pasta maker. How to Wrap Wontons - Now that you have an incredible wonton recipe, it's time to wrap this. I love this video on SlideShare by Chinese Kitchen that includes 11 steps (with pictures) of how to cook the filing (meat and vegetable), scoop it into the wonton, fill the wonton, and finally how to boil them. The best part is that you can watch it over and over until you get your wonton wrapping just right. 1. Shrimp Wonton Soup - Created by A Growing Tradition, this Shrimp Wonton Soup recipe covers how to make a simple broth and the wontons themselves that are filled with shrimp, scallions, and cilantro. The recipe also includes some delicious ideas for garnishes such as bean sprouts and Asian microgreens. 2. Pork and Shrimp Wonton Soup - The adorable food site Food Repulik created this amazing-looking pork and shrimp wonton soup. Using ground pork, raw shrimp, bamboo shoots, and some soy sauce and ginger, I not love the recipe but really enjoyed reading Camilla's personal story about making wontons with her mom when she was a child. 3. 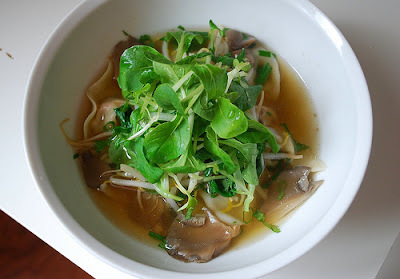 Vegetable Wonton Soup - My first foray into Asian cooking was with this vegetable wonton soup. Using ingredients from a local market in Brooklyn, I added a variety of vegetables (napa cabbage, bok choy, spinach, mushrooms, and carrots) to the wontons that was then cooked in a tasty sesame-soy-based broth. I also added some spicy chili oil and garlic to complete the delicious soup. How do you make your wonton soup? Saturday, March 5th turned out to be a great day for a soup walking tour. Not only was the weather beautiful there were 20 excited soup lovers ready eager and hungry to test out three different soups from Chinatown, Little Italy and then on to Katz's for some Matzo Ball Soup. Although we never ended up at Katz's (more on that below) the tour was a really fun way to check out new restaurants, test new soups and make a few new friends along the way. Next, we were off to Little Italy for some minestrone soup. Now anyone that knows Little Italy instantly doesn't think of it as a place to find authentic Italian food in NYC. Being an ethnic food tour I heard that Da Nico served up some delicious minestrone soup and thought it was worth the toursity adventure - even if I got a little flack for it. The soup menu at Da Nico included Minestone Soup, Pasta Fagioli Canellini, Stracciatella alla Romana (spinach and egg soup), Canellini and Tortellini in Brodo Tortellini. I opted for the Pasta Fagioli with the majority of the soup lovers, including Kathy of The Experimental Gourmand, testing out the Stracciatella alla Romana. Since Pasta Fagioli is a favorite of mine I knew it could do no harm in my eyes and the version from Da Nico lived up to the test: perfectly cooked beans, curly pasta, and a light and creamy tomato broth topped with a heaping dose of parmasean cheese. As full as I thought I was from Tasty Hand-Pulled Noodles I ended up finishing the whole thing, along with two pieces of bread that came with the soup. Kathy also enjoyed her Stracciatella alla Romana that she mentioned "benefited from a dusting of cheese to add a creamy, dairy bite to all the vegetables." After the soup, we were then given plates of pure deliciousness - fritelle with powdered sugar. No matter how full anyone was we couldn't pass on the free plates of fried dough - in fact, I had two pieces! With our full soup (fried dough and bread) bellies we were off to Katz's. Some people left but about 10 of us were ready for more...or at least we thought. When we arrived at Katz's the place was packed. Not sure if it was the combination of the crowds or us realizing we couldn't eat anymore but no one wanted to try their split pea, chicken noodle or matzo ball soup. I, too, was full and actually pretty happy not to eat anymore but I was hoping that one brave soup would try the delicious brothy Matzoh Ball soup, but instead we walked around for a bit and talked before finally ending the tour around Second Avenue. Not only a day of eating, the soup tour through Explorecation.com was a great way to meet new people, try new soups and get excited for the next one: a spring soup and sandwich tour. Stay tuned for details. With Mardi Gras just days away I thought it was finally a time that I tried to make gumbo. More of a stew, this thick medley of chicken, shrimp and turkey (can also sub for andouille sausage) was a fun meal to experiment with whether you are in New Orleans or are just looking for a spicy and hearty soup to test out. 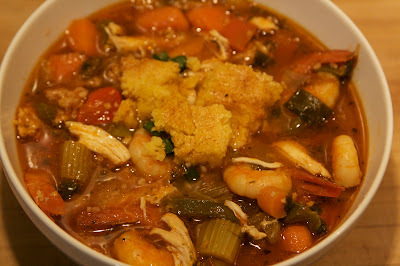 Having never made gumbo before I looked at various recipes and took ingredients from each to craft my own Cajun treat. In addition to the various meats I added carrots, peppers - both red and green, onions, celery, okra, and chili and cayenne pepper and red pepper flakes that gave the soup a nice kick. For the corn muffins, I cheated and used a box but I added various spices (cayenne and chili pepper) in the mix for a spicy crouton that worked really well with this hearty soup. Cut up the onions, green onions and garlic and add them to a medium-sized soup pot with some olive oil. Let cook on a low heat and cover. Cut up the peppers, celery, carrots, okra and add them to the pot, along with the flour, two cups of water, bay leaves, parsley and dill and stir together. Add the tomato sauce and cover. Let cook for 30 minutes. In a separate pot, cook the turkey with any leftover onions (about 15 minutes). Cut up the chicken and add it to the pot, along with the turkey, shrimp, salt, and pepper. Cover and let cook for another 45 to an hour minutes, checking on the gumbo periodically. Turn off the flame, serve and top with a corn muffin crouton. 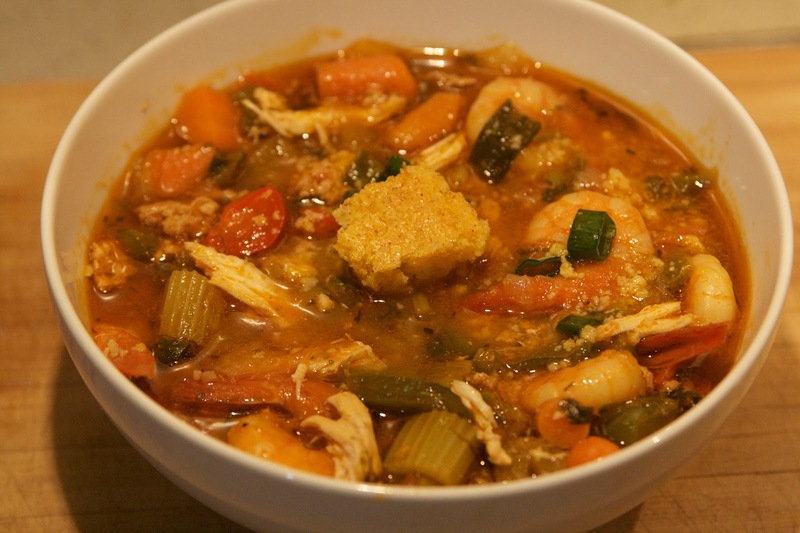 How do you make your gumbo? Today, myself and over 20 soup lovers are going to walk through the Lower East Side testing out hand-pulled noodle soups at Tasty Hand-Pulled Noodles, Minestrone or Pasta Fagioli at Da Nico and some Matzo Ball Soup or Split Pea Soup at Katz's Deli. I'm very excited to host this walking tour with Explorecation.com and in honor of the event here are three recipes of the soups that we are going to test out (hoping to have a hand-pulled noodle one up after this experience). If you can't make this one, there will also be a spring soup tour in April. Refer to Explorecation.com for more details. Happy weekend! Add water to a pot and start boiling. Chop up the garlic, scallions, cabbage and bok choy and add them to the pot, along with some flavorings (soy sauce, sesame oil and chili oil). Chop up the bok choy, cabbage, mushrooms and carrots very fine (this is for your wonton's). Open your wonton's and coat the rim with sesame oil and water add the filings in the center and flap the wonton forward, then scrunch up the sides and close -- be careful not to overfill. Place them in the boiling pot, along with the spinach and extra mushrooms and carrots. Wonton's should be finished cooking when they rise. Taste and enjoy! Let the dry beans soak for about 4 hours. When ready to cook, add water to a pot and let cook. Cut up the onions and garlic and add them to the pot, along with the beans. Cut up the veggies - zucchini, broccili, cauliflower and carrots, along with the tomato sauce and add them to the pot. Let cook for an hour, checking on the soup and stirring periodically. Add the seasonings (basil, rosemary, celery salt, salt and pepper) and pasta and let cook for another 30 minutes. Taste and enjoy! One of the greatest aspects about working on Soupy (other than making the soups themselves) is the amazing opportunity to meet - both in person and online - so many passionate home cooks and chefs. One blogger that I have admired and really hope to meet one day is Nancy Fox. As the creator of Skinny Kitchen, a website devoted to healthy eating and cooking tips, Nancy creates weekly recipes that include Weight Watchers points, a list of healthy alternatives and nutritional information so that you can compare recipes. 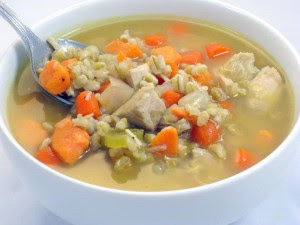 For this guest post, Nancy shared her Amazing Delicious Turkey Barley and Sweet Potato Soup recipe that uses turkey instead of chicken, celery, carrots, sweet potatoes, onions and pearl barley to create a full-bodied soup with great texture. I hope you enjoy this delicious and easy-to-prepare soup and stay tuned for more contributions from Nancy in the next couple of weeks. 1. In a large pot add the chicken broth and barley. Bring to a boil, reduce heat, cover and simmer for 15 minutes. 4. Add the sweet potatoes and season with pepper. Continue to cook uncovered for 20 minutes. 5. Stir in the cooked turkey and cook 10 minutes longer. Barley dates back to the Stone Age. The ancient Greeks relied on barley to make bread and athletes attributed much of their strength and physical growth to their barley rich diet. Pearled barley in high in cholesterol- lowering fiber and is low in fat. A single serving offers 11% of the RDA of iron and has a fair amount of folate and niacin. You can find dried pearl barley in the supermarket aisle with the dried beans. If desired, substitute chicken for the turkey. Skinny Kitchen is your fun guide to healthy yet decadent-tasting foods. Each week we share skinny recipes, cooking tips, food finds, nutrition facts and WW POINTS on every recipe. 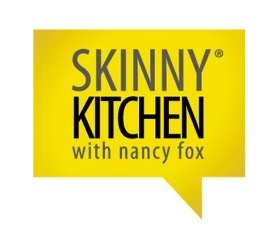 Join Nancy Fox for the recipes and more at http://skinnykitchen.com/. 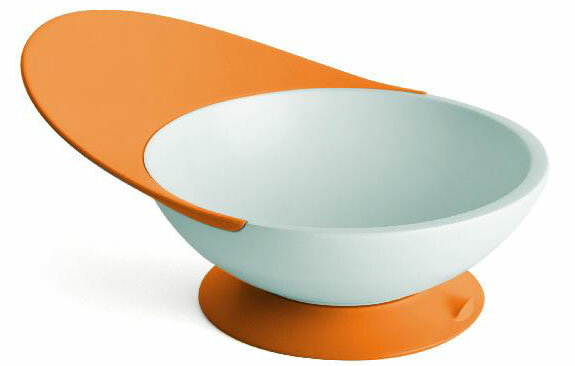 It really doesn't matter how you 'ladle up' your bowl of soup. You can eat it out of an old coffee mug or even a paper cup and your soup will still taste delicious - but sometimes it's nice to have a versatile and cool-looking bowl that is a great for entertaining or to step up the decor in your kitchen. From kid-friendly bowls to those suited for more elegant affairs, I've found five interesting soup bowls to mix up your collection. 1. Boon Catch Bowl - Featuring a built-in spill catcher and suction cup, the Boon Catch Bowl is designed for messy Toddler-eating that works by keeping the bowl firmly planted in one place. I love that it is free of BPA, PVC and Phthalates and soft so you don't have to worry if it (or your toddler's soup) ends up on the floor. 2. 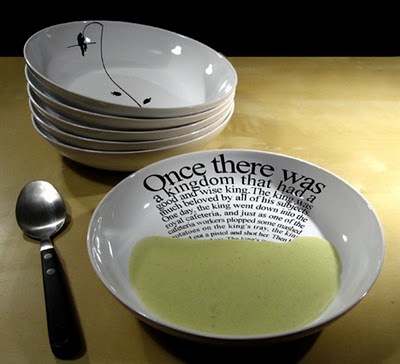 Pretty Soup Bowls - Created by Ayda Anlagan, a London-based industrial designer, these unique artistic bowls were created to illustrate the issue of food wastage in the domestic environment that includes a fishing scene, a child playing, and various quotes. I love their chic and modern appeal that would be great for a fun dinner party. 3. 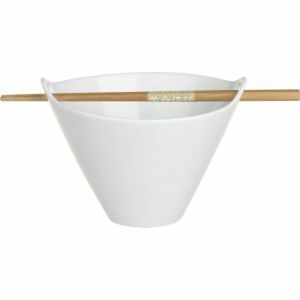 White Kai Noodle/Soup Bowl- As part of the Kai Serving Bowl Series, this modern Asian soup bowl includes two cutout handles for a bamboo chopstick. These porcelain white bowls are also dishwasher-, microwave- and oven-safe. 4. 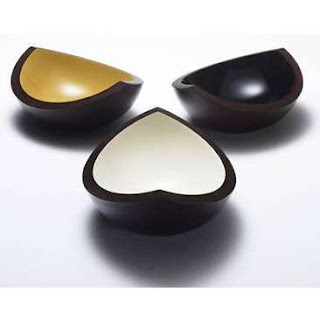 Husque Bowl - Designed by Marc Harrison, the Husque Bowl is made in Australia from macadamia nuts shells whose shape is also inspired by the same nut. The bowl also has a clean finish that is stained with a yellow, white, or black resin. 5. 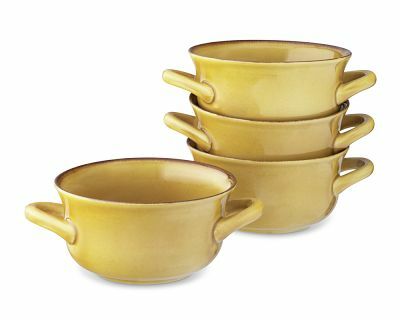 Farmhouse Double-Handled Bowls - Created by Williams-Sonoma, these double-handled rustic bowls are sized to serve hearty portions of soups, chowders and chili. Since they are made out heat-resistant stoneware, the bowls can also be used for baking casseroles, pot pies and individual portions of macaroni and cheese. The set of four is also microwavable and dishwasher safe.